So report are claiming more and more users are embracing the subscription streaming service. As a matter of fact, Spotify just passed the 40M milestone. Should we actually celebrate? Is this good news for musicians, creators and all copyright holders? Or this just a revenue growth for Daniel Ek and his fellow startups moguls? So here's the deal: streaming services are gaining more audience everyday, scoring more subscribers. But the music streaming business ain't any business. It's virtual. It's selling thing that don't even exist, but yet are available in countless supply. There's no selling out on music streams. As long as kids are hitting the "play" button, the services are delivering a fresh stream a music bytes. And all these are included in the user's plan. That's the catch. Unlimited plans. streaming revenue is fueled by ads and subscriptions - well, mostly subs, actually. charges, on the other side are royalties and advances paid to distributors, labels, publishers... for each single stream. Ever wondering which of those numbers are growing faster? 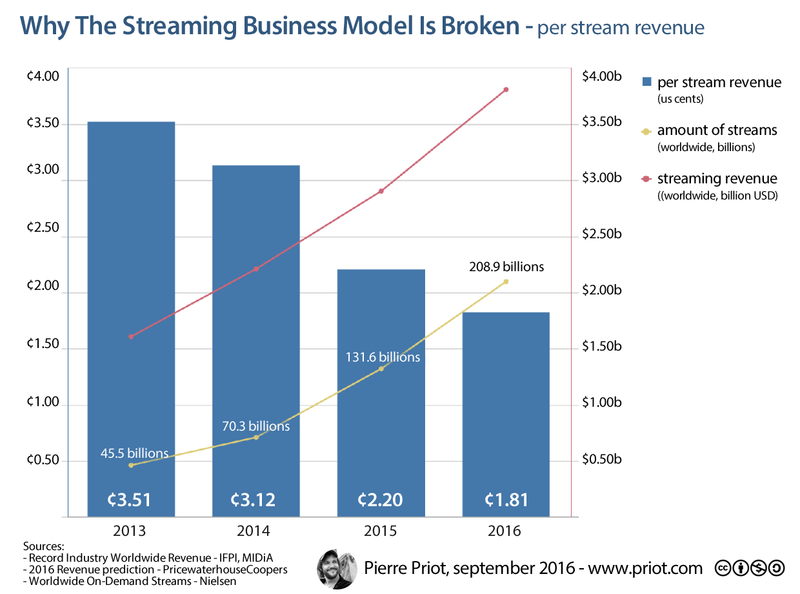 Let's clear it out by making the per stream revenue breakdown over the past years. The streaming business model clearly fails to make profits from its tremendous audience acquisition. The more people play stream, the smaller the piece of the pie to be shared with each copyright holder. The availability of unlimited streaming for subscription users makes it impossible to keep revenue in sync with spins. The per-stream-revenue ratio keeps plunging down as more and more users make the jump and quit physical and even downloads to switch to streaming services. Even if a large fringe a them may subscribe to a plan, may it be Apple Music, Spotify, Deezer or Tidal, the revenue won't match the huge tidal wave of stream spins - over 200 billions as the industry expects for 2016. This means that streaming services won't have any other options than lower the producers and publishers revenue shares. Who's gonna pay the price for this broken business model? Just as we feared, artists, creators... music makers. Don't feel sorry about the big hit makers, they've got it all sorted, are getting paid advances when the regular guys get the dimes wired with a six months delay... and they will all needed support for the industry's big hot shot lawyers to negotiate guaranteed fees. In the bottom line, the record industry of the digital age is just as evil as the old analog one: the chart winner takes it all!